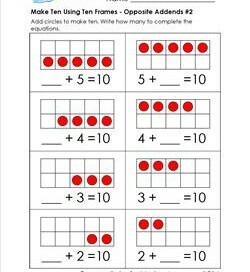 Make 10 with these nice sized ten frames. 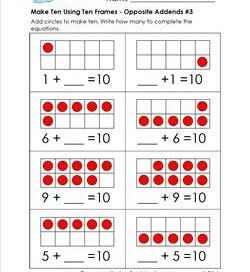 Kids make circles in the ten frame to make ten and write that number in the first addend. Answer sheet included. 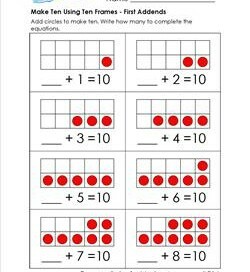 Making ten can be done in many different ways and using ten frames is one of them! 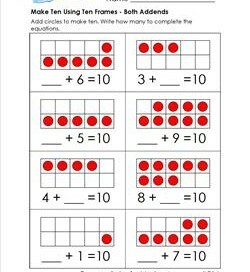 Fill in the missing second addend and the ten frames. Answer sheet included. 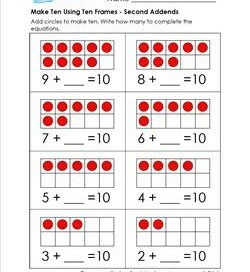 Making 10 using ten frames is a cool way to find sums to ten. Draw in the missing circles and color them. Write the missing addend. Answer sheet included. In this make 10 worksheet the same number is switched from the first addend to the second addend. Answer sheet included. Ready for the big reveal? Problems like 6 + 4 and 4 + 6 both equal 10! 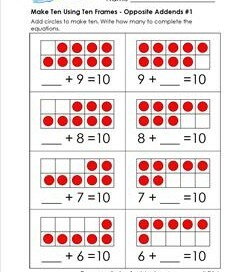 Fill in the circles and missing addend in each make 10 problem.